Markeeta Haddley’s job description at the nursing home where she worked did not include making sweet treats for residents. Haddley, a Battle Creek resident who grew up in the city’s Washington Heights neighborhood, says she made the people she was caring for confections such as chocolate-covered strawberries because the “elderly love sweets.” And these little kindnesses laid the groundwork for a retail business she will open in mid- to late-December in the city’s downtown business district. Her business, Simply Sensational Berries, will share a 675-square-foot dedicated incubator space at 80 W. Michigan Ave. with Cafe Rica, another home-grown business, that will sell bagged coffees and hot and cold-brew coffees. The location is designed to give each business the opportunity to grow without having to make a huge upfront investment. Haddley began making her confections in the kitchen of her home. She says she really wasn’t thinking of becoming a full-fledged business owner until photos of her creations she posted on Facebook led to orders being placed. This was near Valentine’s Day and Haddley was up at 6 a.m. filling the orders. She finally finished at 10 o’clock that night. She kept posting the photos and information about her products and the orders continued to come in, especially when it was a theme day such as St. Patrick’s Day or a holiday such as Easter. “I kept going to Michael’s to get different decorations for different days and people started asking for my products for parties,” Haddley says. One of the people who saw her Facebook page was Valerie Byrnes, Business Retention and Development manager with Cereal City Development Corp., which works with the city of Battle Creek on small business development projects. Cafe Rica, owned by brothers Tristan and Jackson Bredehoft, will be the anchor tenant and will open at the same time as Simply Sensational Berries. The Bredehofts' business represents one of the first success stories for BC Cargo, a pilot program started by the city’s Small Business Development Office to give startup businesses low-cost options for entry into the downtown retail district. Byrnes says John Hart, Small Business director, came up with the idea. 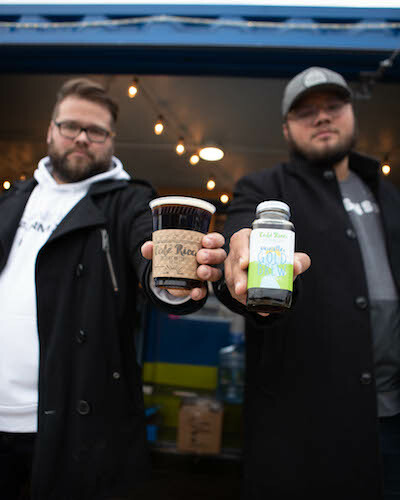 Tristan and Justin Tristan Bredehoft show off their drinks.BC Cargo is an economic development effort started by the Small Business Development Fund with the purchase of seven recycled shipping containers that were renovated into food service and retail spaces to create a seasonal marketplace in downtown Battle Creek, Byrnes says. The initial investment was $110,000. Tristan Bredehoft says he and his brother knew that when October rolled around and the weather became less hospitable to outdoor activities, they would see a shift in what people ordered and how much they would frequent BC Cargo. 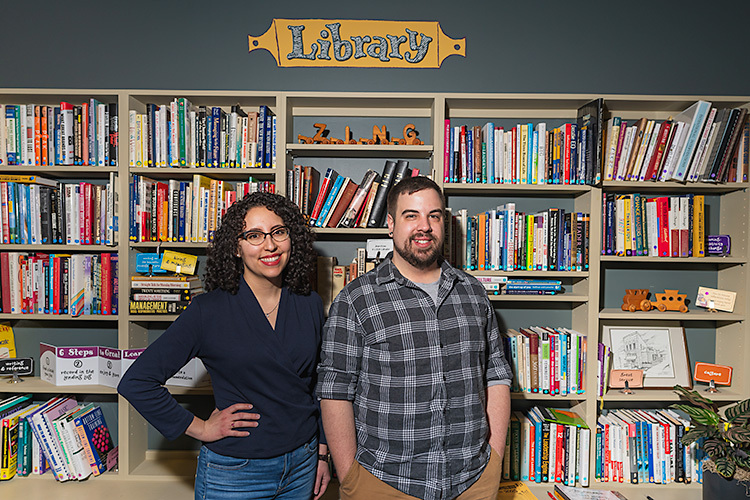 “We were working with John and Valerie to see what the next step could be and they said they had an idea about a shared incubator space with us and another business,” Bredehoft says. While Haddley’s side of the space will feature products such as chocolate-covered strawberries and other types of fruit, chocolate-dipped pretzels, decorated Rice Krispie treats, and caramel apples, Cafe Rica will offer bagged coffees, and a variety of hot and cold-brew coffees. Cafe Rica started in 2016 when the Bredehoft brothers began an online business selling bags of coffee beans from Cafe Naranjo, a co-op of small-scale coffee growers in Costa Rica. The Costa Rican coffee co-op is a conglomerate of 2,400 family-owned farms, 40 percent of which are female-owned and operated. The co-op has been operating for more than 50 years and shared with the Bredehoft’s that they wanted to maintain financial stability for those family farms. 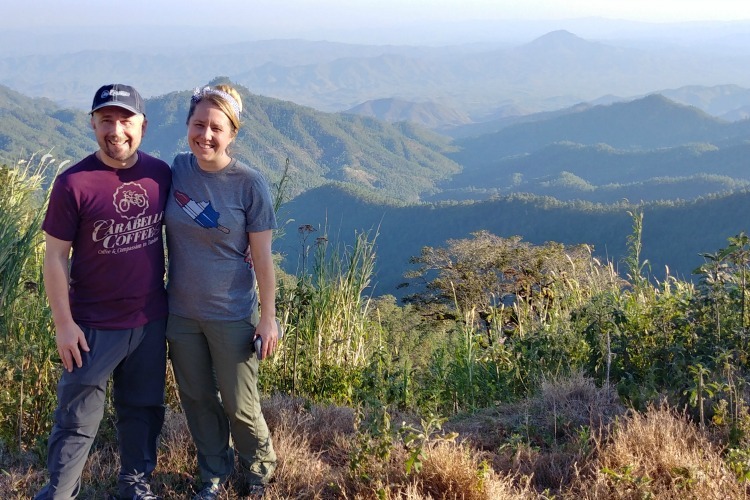 The Bredehofts' mother, who is from Costa Rica, provided a natural connection. That idea came from the success of an online model airplane business their father had been operating. “When I got back from my internship they pitched it to me and I was on board,” Bredehoft says. The company officially formed in September 2016. While the brothers' business acumen was partly the result of what they saw their father achieve and partly on-the-job training, Haddley says she had lessons early on from her mother who sold handmade candles. 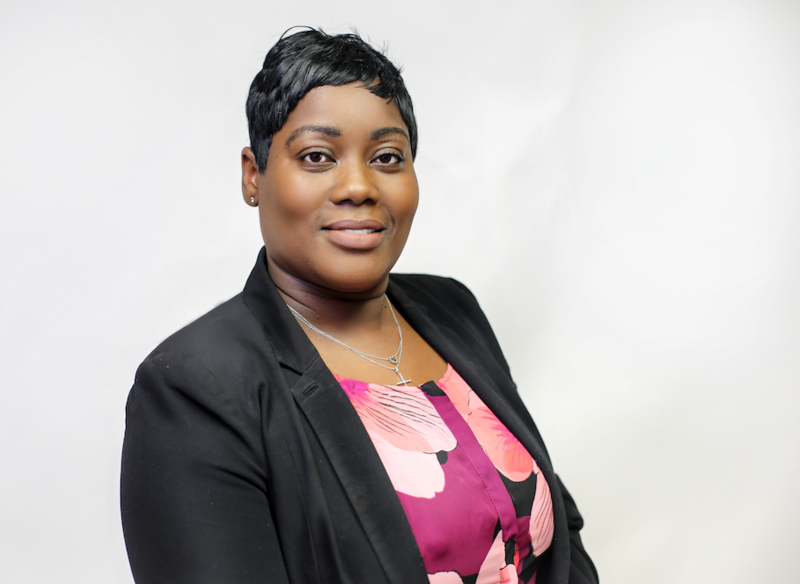 A graduate of Battle Creek Central High School, Haddley took some online business classes through Phoenix University but had to stop when she got pregnant with her daughter. 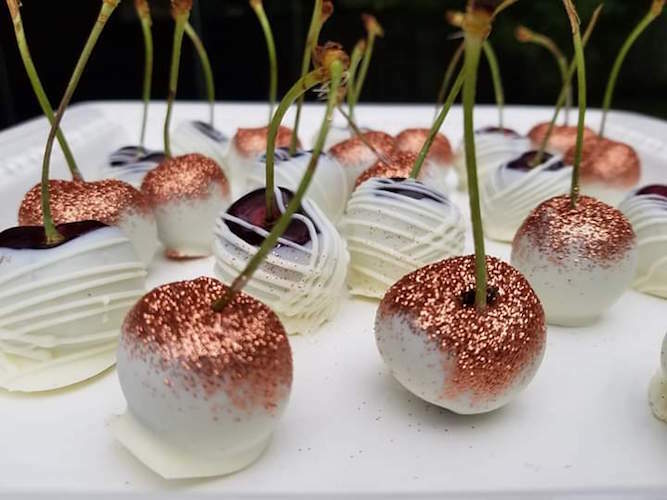 Cherries dipped for a special occasion from Simply Sensational Berries.“I had my daughter really young and it was hard to manage any additional schooling,” she says. With an eye towards becoming an Activities Director, she took a job at The Oaks, an assisted living facility in Battle Creek. She completed the first half of training for this position and got hands-on experience through cooking classes she taught to Oaks residents on Saturday mornings. Six months ago she left her job with The Oaks, mostly to focus on her growing business, but also because also because she needed to do something different. She says she didn’t expect her plan to come together so fast. “So now I don’t work for any company, but I’m always working,” Haddley says. But, she’s not complaining. Like the BC Cargo concept, the incubator space is designed to be a place for businesses ready to move to the next level point. The goal is to move a business from the incubator space into an even larger space. Byrnes says Haddley and the Bredehofts have signed one-year leases. The Bredehofts declined to say how much their monthly rent will be, saying instead, “it’s a reasonable rate that will allow us to grow.” Hadley says she will pay $450 per month. “We want to transition them into more permanent spaces and then rotate in other businesses,” Byrnes says. “The building is owned by the city and the intent was always to lease it as a commercial property. The BC Cargo site was meant to house seasonal businesses from May to October. Byrnes says some of the businesses are staying open this year through December as part of a pilot plan. Bredehoft says he doesn’t know if Cafe Rica will have the capacity to staff two locations once BC Cargo re-opens next year. The Bredehofts say their plan is to focus on a traditional brick and mortar business. Byrnes says BC Cargo is meant to serve as a starting point to get businesses to that next level. She talks to the business owners to find out what their transition is at the end of the season. “For some, they may go back to a larger space they already have or come back next year,” Byrnes says. “In Cafe Rica’s case what they’re doing is a natural transition and they’re probably a couple of years ahead of what they originally thought. They are the Golden Child of incubation and transition, mostly in the way they took it upon themselves to really put themselves out there on social media and through their use of marketing. Southwest Michigan Second Wave’s “On the Ground Battle Creek” series amplifies the voices of Battle Creek residents. 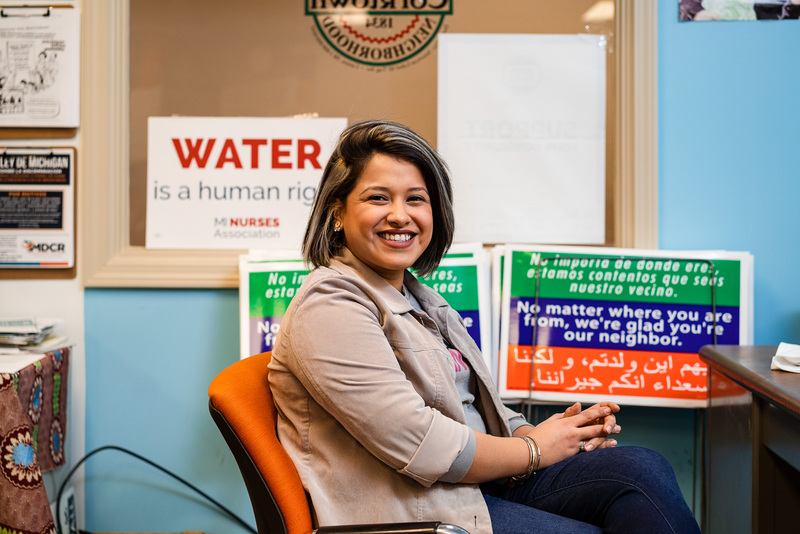 In the coming months, Second Wave journalists will be in Battle Creek neighborhoods to explore topics of importance to residents, business owners, and other members of the community. To reach the editor of this series, Jane Simons, please email her here or contact Second Wave managing editor Kathy Jennings here.